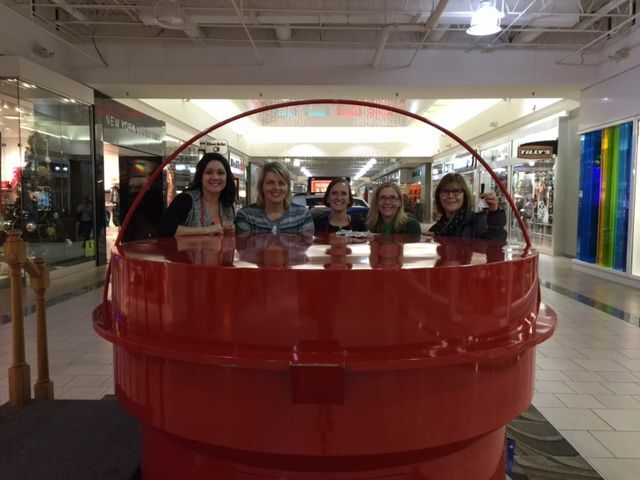 A few colleagues from Associated Bank’s Women’s Network (AWN) spent their evening ringing bells for the Salvation Army at the Bay Park Square Mall in Green Bay. Since its inception in 2011, members of the AWN have volunteered to ring bells each holiday season for The Salvation Army’s Red Kettle Campaign. The famous red kettles began as a way to provide a free Christmas dinner to the growing destitute and poverty-stricken population of San Francisco. In 1891, Joseph McFee set up a pot at the Oakland Ferry Landing as a way to fund his idea. Now, 124 years after the initial pot, the annual Red Kettle Campaign assists more than four billion people during the holiday season. Photo caption: Holly Goza, Carrie Kryzanek, Vicki Swan, Brooke White and Cathy Vander Zanden of Associated Bank ring bells for the Salvation Army.